In recent years initiatives such as the Clean Energy Partnership in Germany have demonstrated hydrogen’s suitability for everyday use, with practical hydrogen refuelling stations and vehicles. Now the first automobile manufacturers have launched series production of their fuel cell electric vehicles, and others are planning to follow suit over the next few years. A basic network of refuelling stations must, however, be in place before hydrogen can be introduced as a commercial proposition. COHRS, Connecting Hydrogen Refuelling Stations, is to build a total of 20 hydrogen refuelling stations in Austria and Germany. The aim is to open up major European corridors for hydrogen mobility. Over and above this, the project is finding out more about customer acceptance, comparing business models and investigating technical solutions for the expansion of the European hydrogen infrastructure. In Germany, H2 MOBILITY Deutschland GmbH & Co. KG is coordinating, planning, building and operating hydrogen refuelling stations. 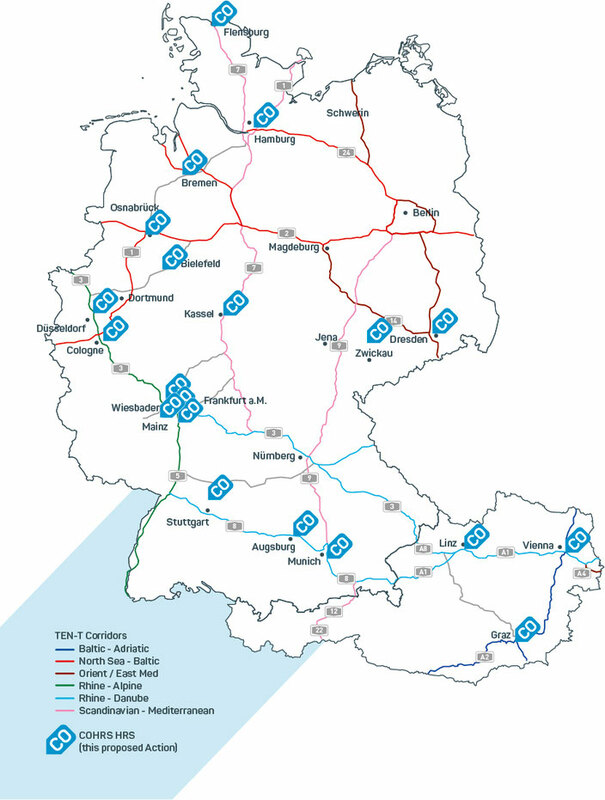 Within the scope of COHRS, H2 MOBILITY is building 17 hydrogen refuelling stations along the most important trans-European corridors in the German federal states of Hamburg, Lower Saxony, Brandenburg, Saxony, Saxony-Anhalt, North Rhine-Westphalia, Hesse, Baden-Württemberg, Rhineland-Palatinate and Bavaria. In Austria, OMV already operates hydrogen refuelling stations in Vienna and Innsbruck. Within the framework of COHRS, OMV is now planning to establish three more hydrogen refuelling stations to serve the Greater Linz, Vienna and Graz areas. All these stations will lie along major European axes, and will connect Austria up to the Europe-wide network of hydrogen refuelling stations. COHRS receives funding within the framework of the Trans-European Transport Network (TEN-T) through the Connecting Europe Facility (CEF). The Trans-European Networks (TEN), are inputs of the EU designed to develop the Single European market and help foster standardisation. Alongside the transport sector, which embraces roads, seaports, railways, inland waterways and airports, TEN also targets energy, telecommunications and satellite navigation (Galileo). In the transport sector, TEN-T, nine corridors with a total length of more than 15,000 km are to be developed by 2030. Six of them go through Germany and Austria.